These yummy chocolatey orangey biscuits will just pop on your tongue and leave you wondering if you have room for another one – or two – or three. I was poking around in the fridge and what did I find hidden at the back but a jar of my homemade cashew nut butter and it was crying out to me ‘eat me’ ‘use me’ ‘I’ll make something delicious!’ Ideas started flying around in my head. What did I fancy eating? Something chocolatey, something with my favourite orange oil (is there really anything better than opening that biscuit tin and the scent of orange hitting you – it makes me feel so hungry happy every time!) Something that will melt in my mouth and give my taste buds a wonderful treat! Well I’ve always had a thing for sandwich biscuits so it was a bit of a no-brainer really. It had to have a filling, the filling had to be chocolate and once tasted - I had to share it with you! 3) Add all the remaining ingredients and mix thoroughly. 4) With a ½ tbsp spoon measure out rounds and press down firmly. 5) Bake for 10 mins. 6) Remove from the oven and set aside to cool on the tray. These will come out of the oven soft but will firm when cooled. 1) Whilst cooling the biscuits melt the cocoa butter in a bowl over a saucepan of boiling water. 2) In a separate bowl mix together the coconut sugar and cashew nut butter. 3) Add the melted cocoa butter and stir it in slowly. 4) Add all the remaining ingredients and stir until smooth. 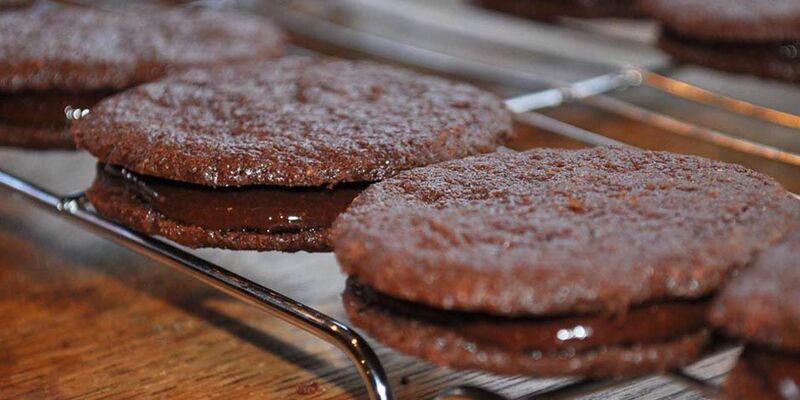 5) Sandwich the biscuits together with the chocolate orange filling and allow to set for at least 2 – 4 hrs. Just asked my niece what she thinks of these biscuits……………………………………………..